Last weekend I went to visit some friends who moved to Kentucky. While we were visiting, I did two activities that I think generally are associated with children—not that adults don’t do them, but I’m speaking generally here. We tie-dyed some t-shirts and we flew a kite on a warm, sunny day. Both were wonderful. I was giddy. You should have seen us. 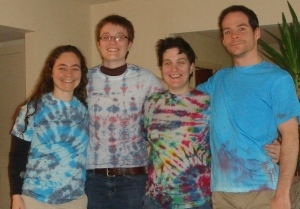 We laughed and joked while making our multi-colored shirts, and the next morning we huddled around each other for the unveiling, cutting off rubber bands to see if our creations were any good. All of us—thirty years and olde—stood in excited anticipation to see what we’d all created. And we oohed and aahed at the majesty of it all. I felt so happy.